Before I reached Las Vegas, I turned west on I-15 for a few miles, then off on a two-lane highway, crossing into California and on to the town of Baker, where I attempted to grocery shop (Baker’s supermarket was nothing to write home about — I’d have shopped in Kingman, except that I was expecting to have to go through a California agricultural inspection station, which the road I crossed the border on did not have). 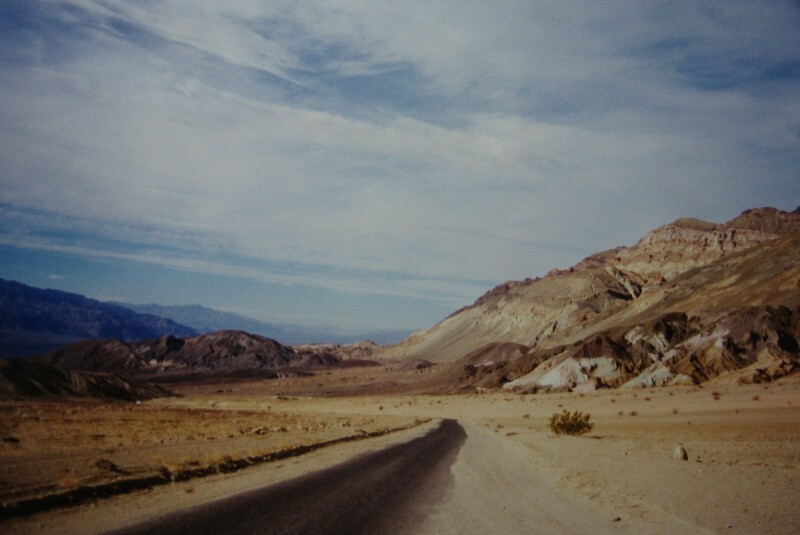 Then I turned north, heading towards Death Valley National Park, and lost all my traffic, which was very nice. The sign says “Badwater” and the elevation. And I’m not arguing about the description. See that white dot a bit more than halfway up the hillside? That’s sea level. “I stopped at the visitor center at Furnace Creek, where the temperature was in the 80sF, and saw their exhibits and picked up a guidebook. I walked a short trail out to an old borax works (still haven’t figured out what makes borax so valuable).” And then I came on up to Stovepipe Wells and settled in. 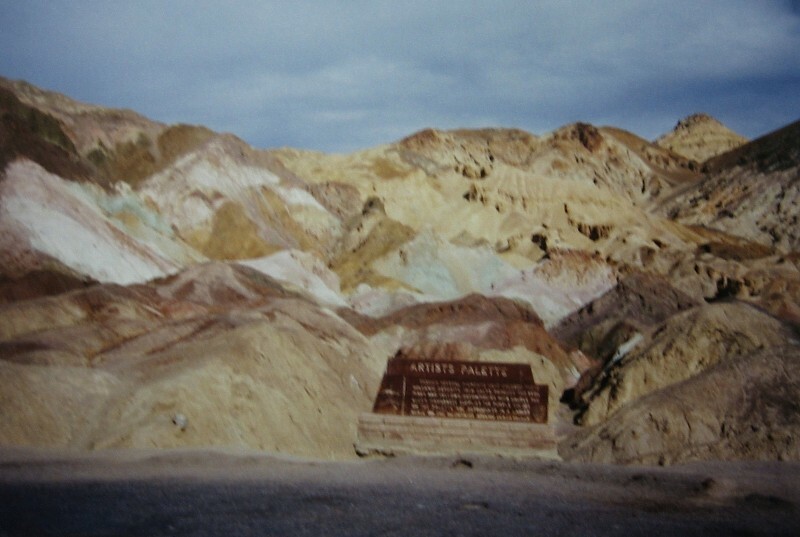 The last time I was in Death Valley I was about seven or eight, I think. My parents and I drove up there from LA for a long weekend in February one year. I have two really strong memories of the place. One was of my dad pulling over at a rock formation called The Devil’s Golf Course (they’re big on Satanic names here), my mother opening her car door, putting a foot out, and yanking it right back in. Turns out there was a rather large tarantula waiting to show her around. My other memory is of getting rained on. Yes, in Death Valley, where the average annual rainfall is less than 2″, we got rained on. It wasn’t enough to do more than stir the dust on the car, but still. How many people can say they were rained on in Death Valley? I sat out at a picnic table to eat my supper while darkness fell around me. The stars were spectacular that night. It’s too bad I couldn’t get any decent photos of them. But I was awfully glad my motel room was air conditioned. Even if it was the middle of November.